Most elbow pain has a simple cause such as a pulled muscle or inflamed tendon which usually clears up within a few days. However repetitive strain of the elbow is quite common and this can be painful and take longer to go away. It is also possible to get arthritis in the elbow. For more detail on problems please see the diagnosis section. Tennis elbow is a repetitive strain injury to the tendons on the outside of the elbow. The Extensor carpi radialis brevis is usually the tendon involved, it helps stabilise the wrist when the elbow is straight. With overuse small tears occur in the tendon leading to inflammation and pain. Golfers elbow is similar to tennis elbow in that is is another repetitive strain injury involving tendons but this time the tendons are on the inside of the elbow. This is less common than tennis elbow and can be caused through the muscles that allow you to grip, rotate the arm and flex the wrist. Treatment and recovery is similar to tennis elbow see the Silver membership area for more information. This is an auto immune disorder and can be diagnosed through a blood test. RA can cause swelling and redness symmetrically on both sides of the body. The elbow can feel stiff and have less movement. Osteoarthritis in the elbow is when the cartilage in the elbow starts to wear away. You may get bony growth occurring as well as swelling and pain. Sometimes clicking and grinding can be felt and you get less movement. Pain at the elbow, arm or wrist can be referred from a problem at the cervical spine (neck.) A disc protrusion from the neck can trap a nerve there and cause pain all the way down into the elbow. Or the nerve can be pinched at any point from where it leaves the spinal cord at the neck, into the shoulder, elbow or wrist. For more details on diagnoses please upgrade your membership. 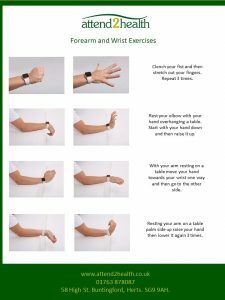 Here is the first set of exercises which help both the wrist and elbow. Upgrade to silver for videos. 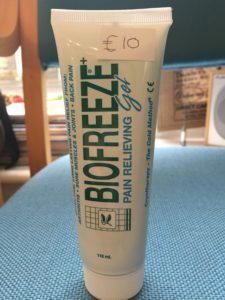 Biofreeze can be quite soothing if your elbow is painful. 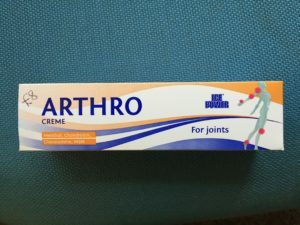 If you are suffering from arthritis in the elbow this gel can sometimes help. 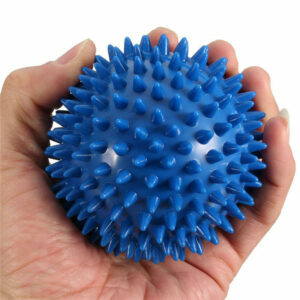 Rolling a ball over the muscles in the elbow to massage them can help to ease the muscle spasms.